Michael Bath's chase on the same afternoon. The chase from the 3rd to 5th November 2000 will be regarded as one my favourite all time chases. 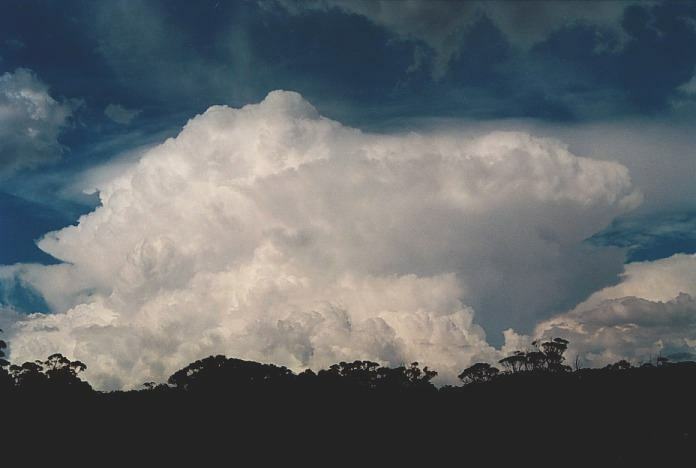 I went through the emotions of frustration at missing the Sydney supercell and tornado (see article by Matt Smith), to absolute astonishment as I watched a supercell with the most incredible structure develop before me two days later. It is the beaver tail photograph that will take the honours of this chase. This part of the chase was also special as I watched a supercell develop and go through various transitions and changes in structure. More below. I took Friday off as I thought it was an ideal set up. Actually Sydney was not looking too bad either but the models had the Hunter firing and this took my fancy. You simply don't take the day off and hang around Sydney. Well what an idea that was!! 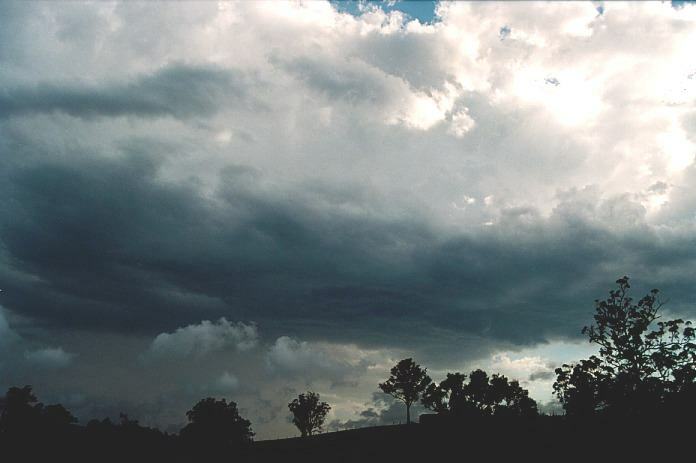 The models were indicating instability and a favourable moisture profile for severe thunderstorms. The dew points were very high particularly in Sydney and the Hunter compared to normal. 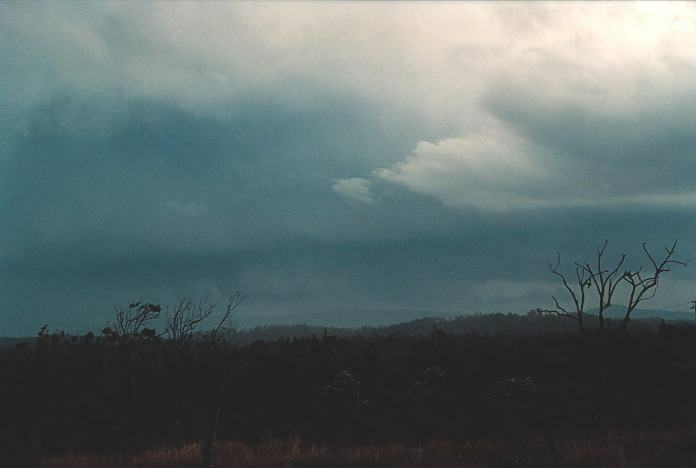 I decided it was time to head for the Hunter and whilst on the way to Richmond around late morning, large congestus were already starting to fire over the Wollemi National Park just east of Lithgow. 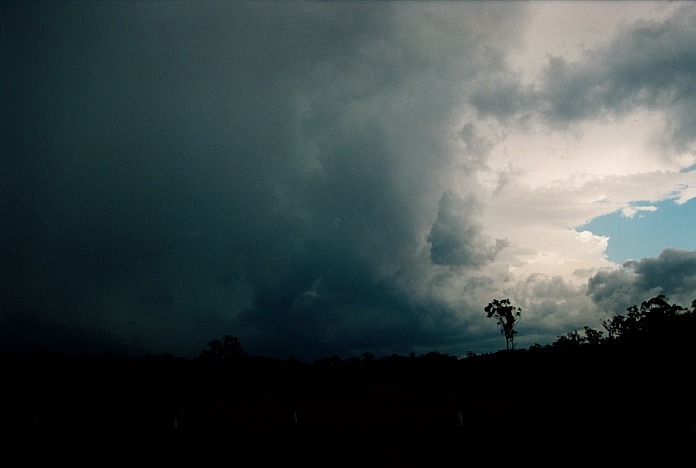 The first may have collapsed but the second exploded into a major updraught and eventually into a major hailstorm. Perhaps radar will confirm a supercell that basically remained active for the next few hours. I arrived at Muswellbrook about 1:30pm and met up with Paul Graham and David Croan about 2:00pm. 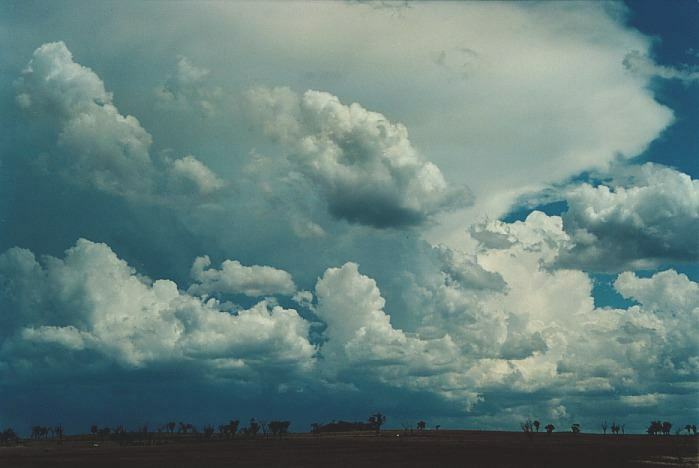 We had lunch and discussed this storm and another storm they had seen down southwest of Sydney. 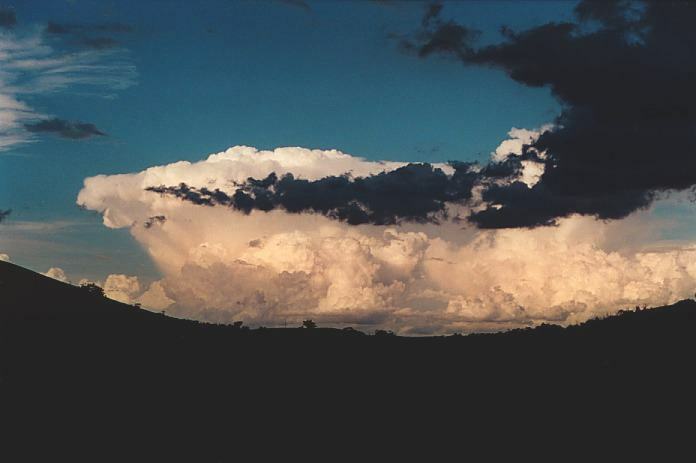 We then decided to go to a vantage point on the outskirts of Muswellbrook to observe this severe thunderstorm coming over Jerrys Plains (the one we had both observed earlier). 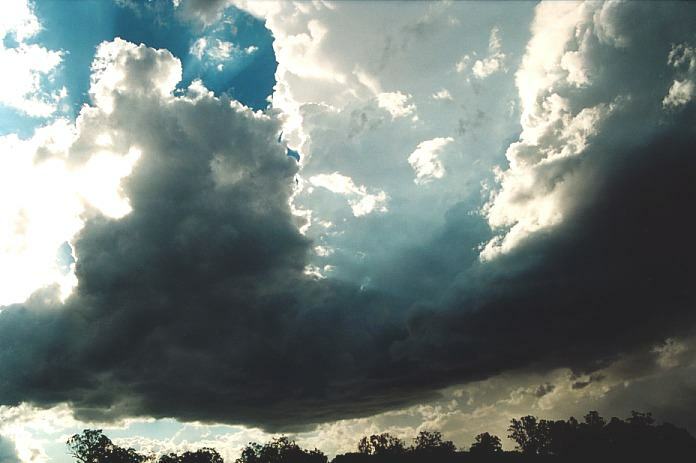 Because the storm was observed from the outside and it was hot and hazy, the storm did not look that spectacular. 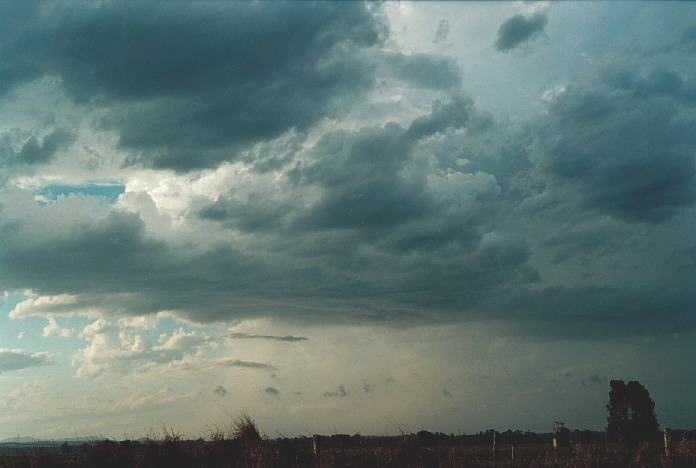 Though I began to draw attention to low level scud activity that persisted for some time indicating strong outflow and perhaps convergence. 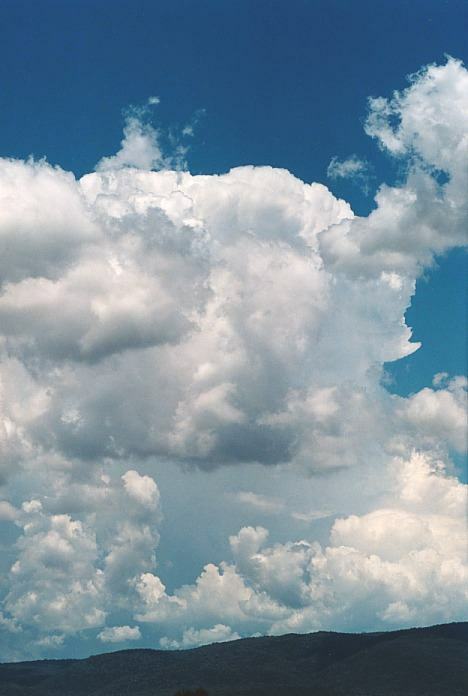 It was dry outside of the storm and cumulus fields were not as strong. So when David and Paul heard of the activity in Sydney: smashed windscreens on the F5 Freeway and then later the activity moving into Sydney, I didn't really try hard enough to keep them from getting back. 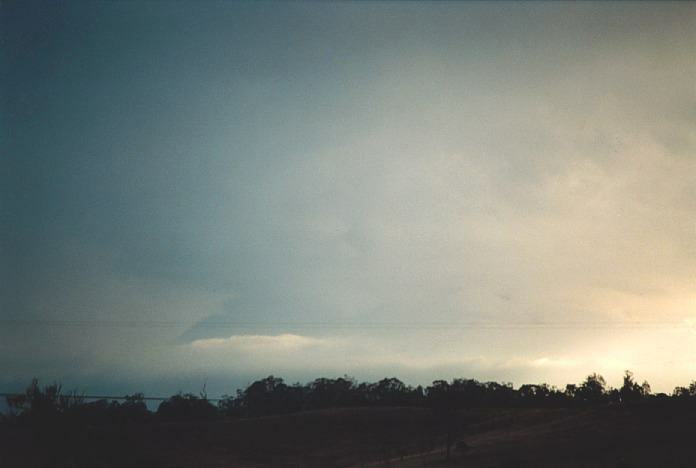 (We then found out about the Sydney tornado - half an hour by car from my home). 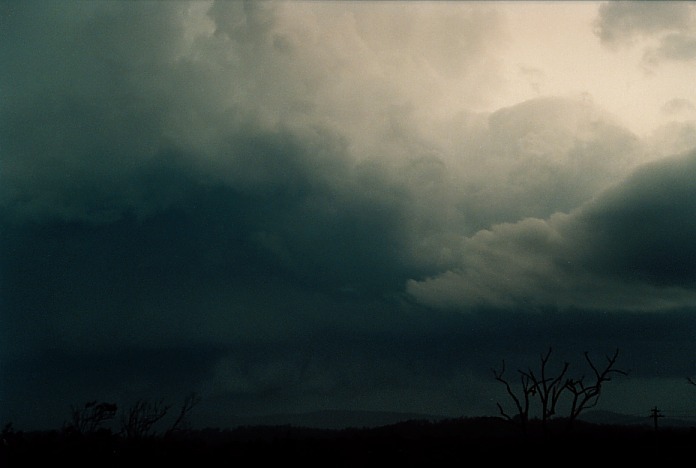 But I soon received a phone call from David and Paul that they were observing a wall cloud and rotation nearby them at Jerrys Plains (more about their chase in David's report here). Wow! And we had observed what seemed to be a not so impressive system. 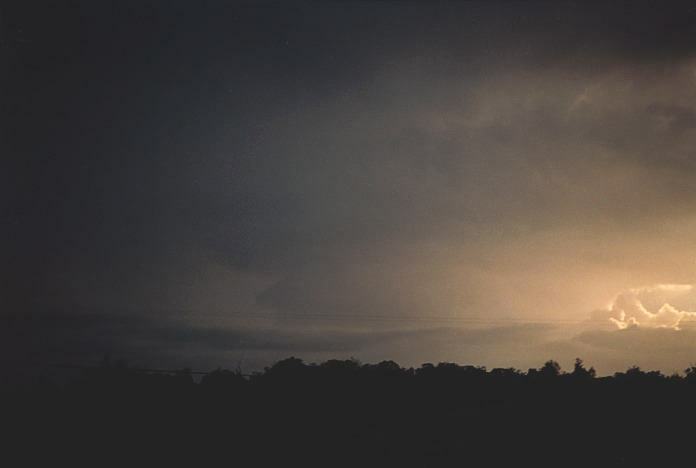 I believe that the vigorous scud activity was a significant observation indicating the storm was still in progress. I had planned to stay for a couple of days so I began making decisions where I should go. 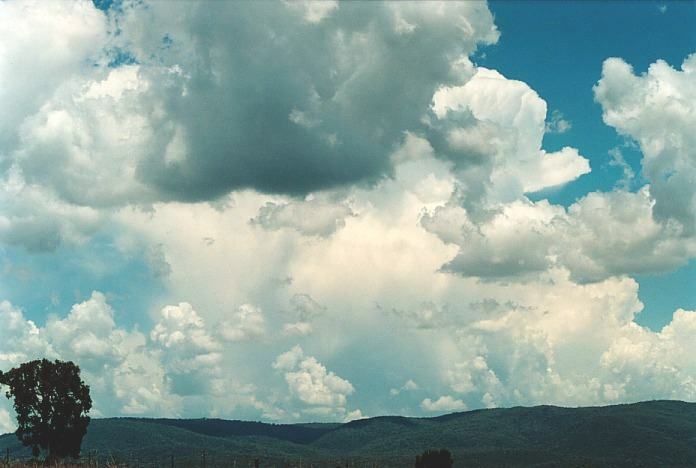 Another storm developing explosively on the ranges. After a few change of minds, I headed for Scone and Murrurindi. What a sight unfolded, a spectacular base and strong updraughts along the right flank of the storm. 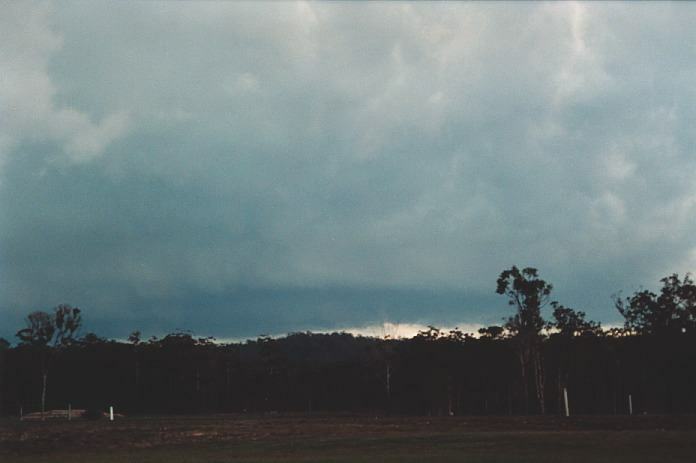 As I made the rise over the Great Dividing Range, I realised that this was going to dump hail. And the rain got so heavy I simply had to stop and then the hail started. It only got to about 1.5cm in size (perhaps some stones to 2cm) but it lasted for about 15 to 20 minutes or so. After deciding to move along towards Willow Tree, I noted that a more serious rain free base section was developing at the rear of the storm. There was a light green tinge observed in the cloud base. I decided to stay ahead of it but it seems that the windshear was not ideal for anything to develop. I stayed the night at a place in Tamworth. 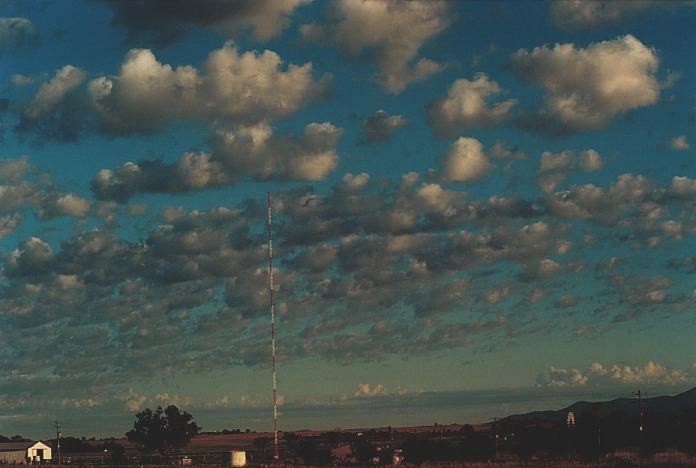 It is always great to wake up to sight of altocumulus castellanus. Well this morning was no exception and was a clear sign the atmosphere was very unstable. After checking the models, it was apparent that storms would go up with extremely unstable air (predicted lifted index values of about -9 to -12). 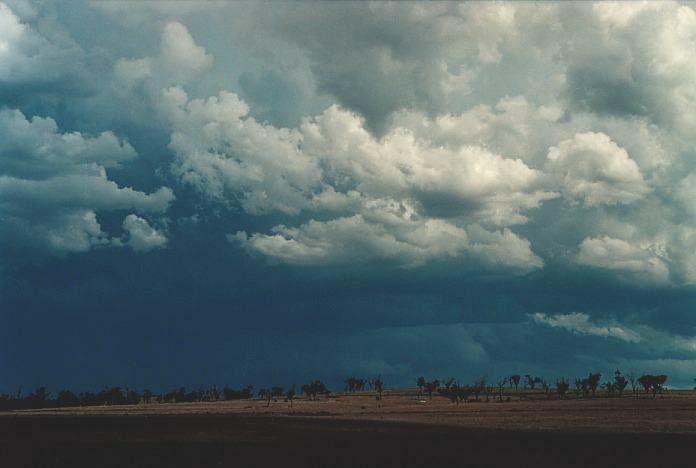 This would be in the region around Moree and even further north and northwest from there. My decision though was to head to the North West Slopes and this way I could head east or west wherever action would decide to take off. I was encouraged by the exploding congestus on the hills. I decided to have lunch at Bingara, and then headed to the top of the hill just outside of town. I saw some powerful updraughts from this system. 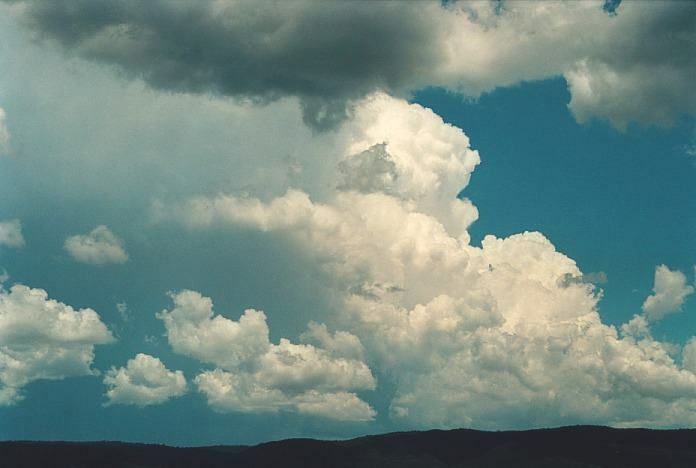 One thing I did notice was that cumulus congestus was occurring all over. 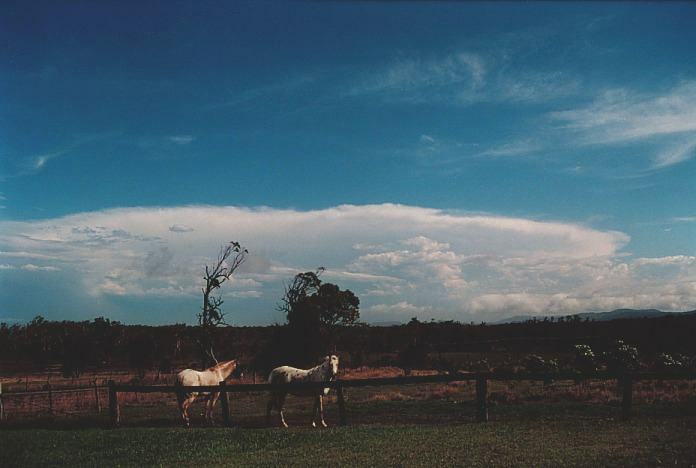 I could also see in the distance thunderstorms developing rapidly over Dorrigo (which got smashed by giant hail late that morning). I was so excited about the prospect of severe weather, I failed to notice the slight wind change from north northeast to northwest. 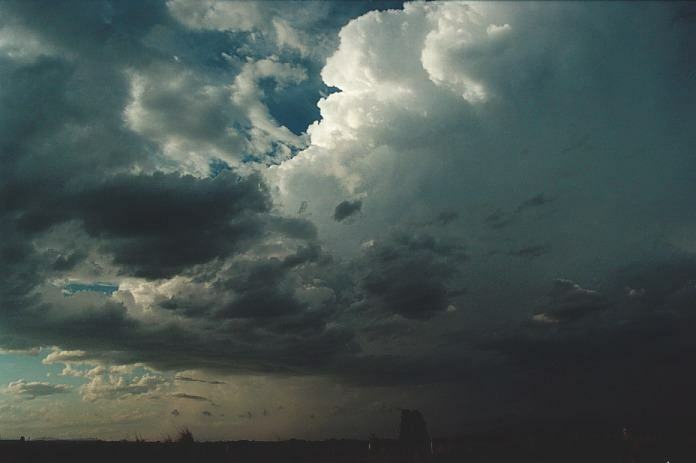 I watched as the cell to my south remained stationary and slowly spread an anvil but really never got going. 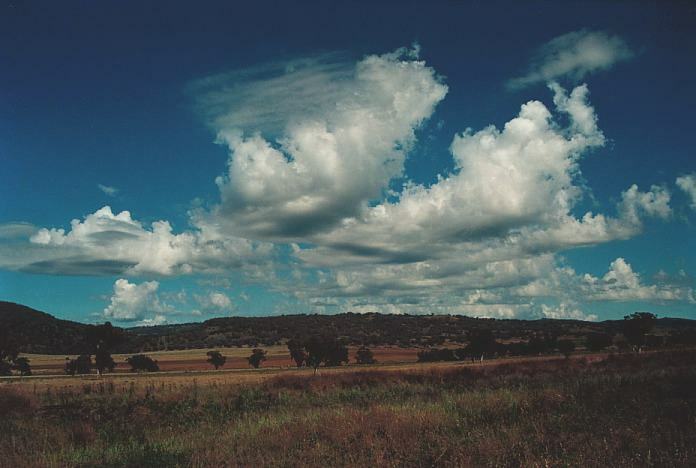 I then decided it was time to make a move and I headed for Delungra on the way to Inverell. Whilst passing through Inverell and on the phone to Geoff Thurtell, I noted a dust devil developing on the road and trees swaying. Geoff actually could hear it over the phone. The closer I got to Glen Innes, it was quite apparent that the main activity was along the coastal ranges and along the coast. 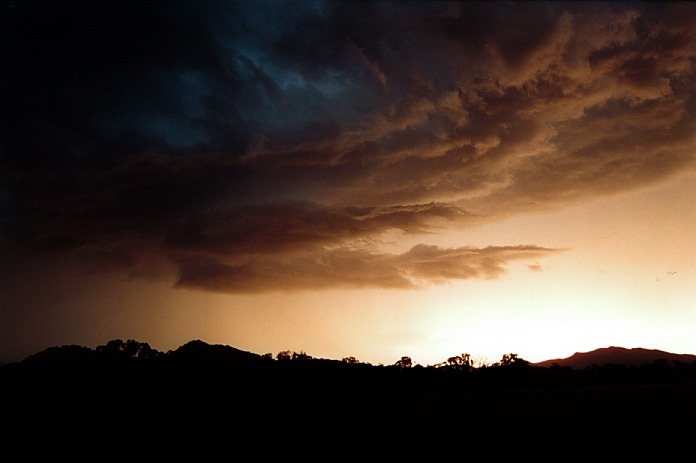 I simply could not believe that the storms were all around except where I was. I made a quick dash to the coast through to Grafton. 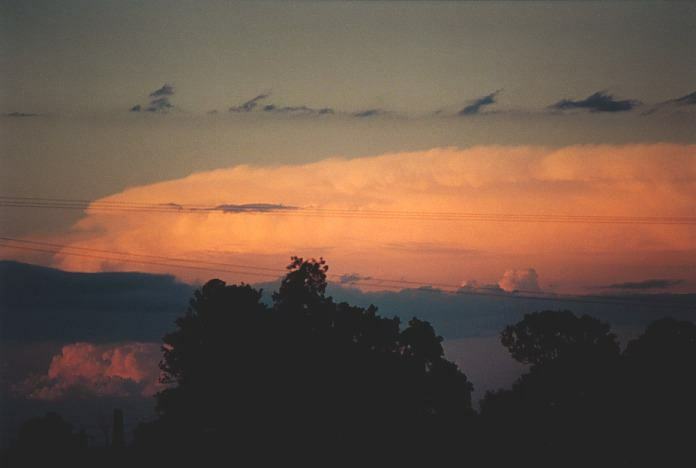 On the way, I observed and stopped for a brief photograph and video session of a mushroom shaped supercell which seemed to be heading due north according to radar reports from Mario Orazem. 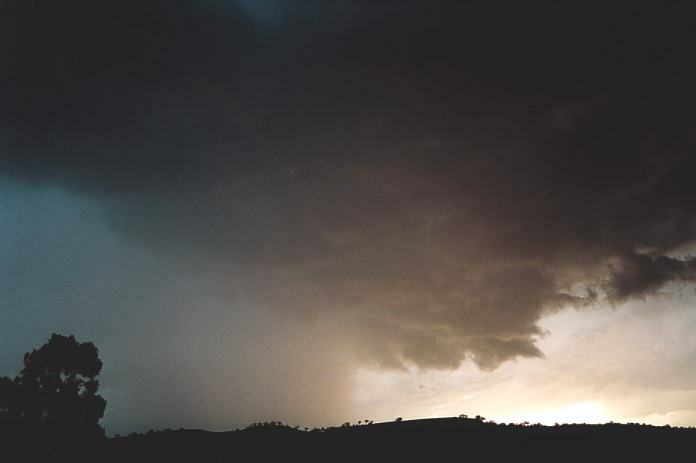 It was a definite HP supercell (High Precipitation Supercell). I had another chance to photograph the whole structure with the precipitation coming out the back end but was in so much of a hurry to get to it. I then found out that the storm was not along the road and low cloud killed any chance of more photographs. So I made my way to Grafton. 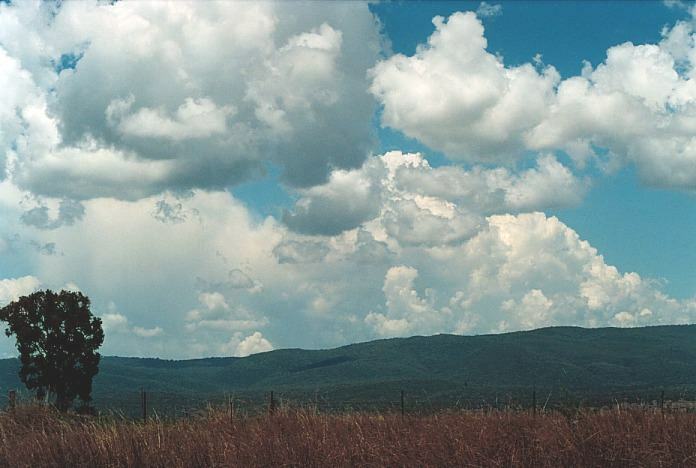 From here, I noted there was a storm in the distance confirmed by Paul Graham. 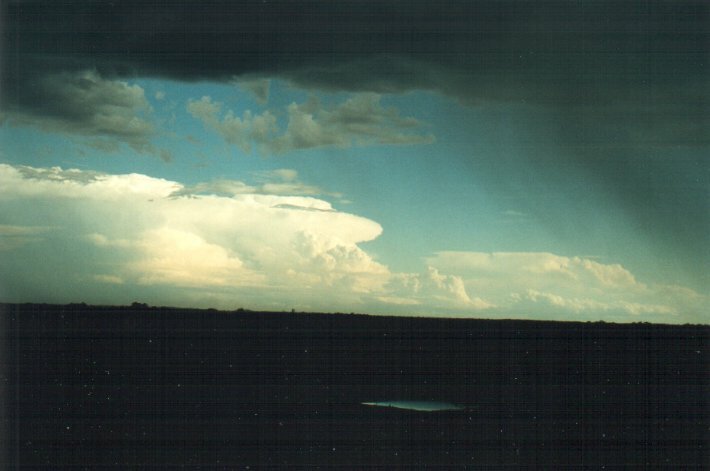 It was yet another supercell with a nice side shearing anvil but difficult to observe due to the moisture haze. It was the second of a set of storms that had developed along the same path, the first being not as severe. 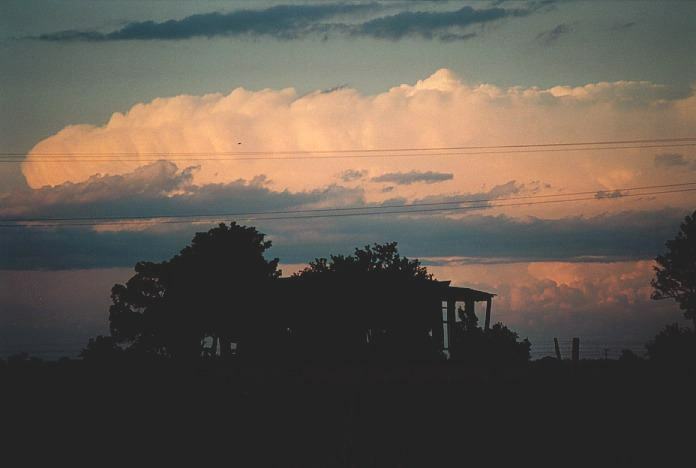 I also made out a wall cloud structure along the northern flank which remained rain free the whole time until sunset. 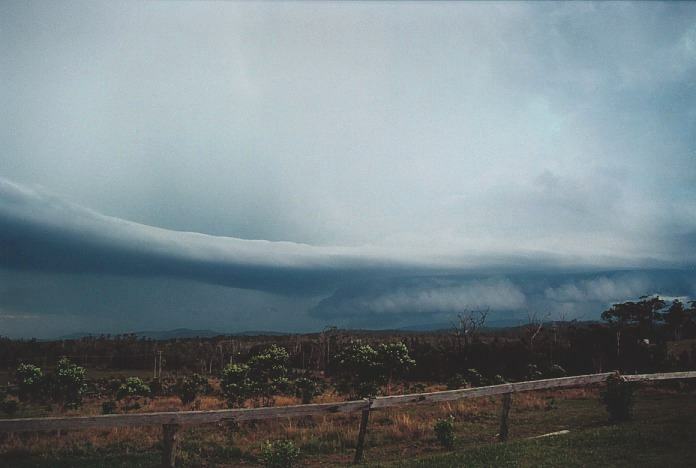 It seemed the coastal areas and especially in Queensland, supercells were going strong all over. 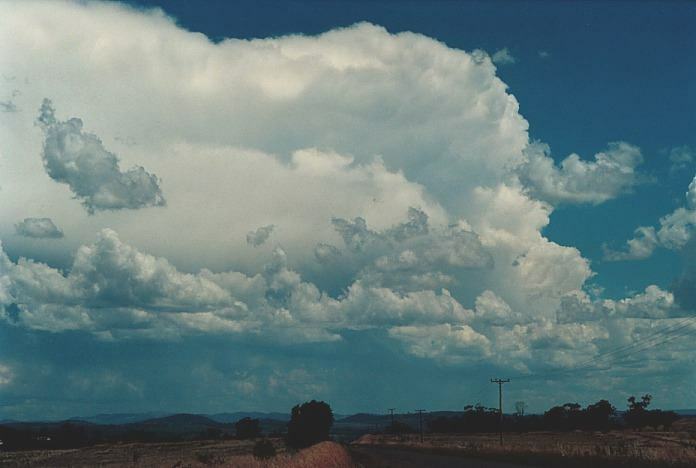 One strong cell was observed over the border in Beaudesert - about 250km or so away!!! What a sight. I booked into the Roaches Hotel for the evening and caught up with a mate there and discussed the day's activity. 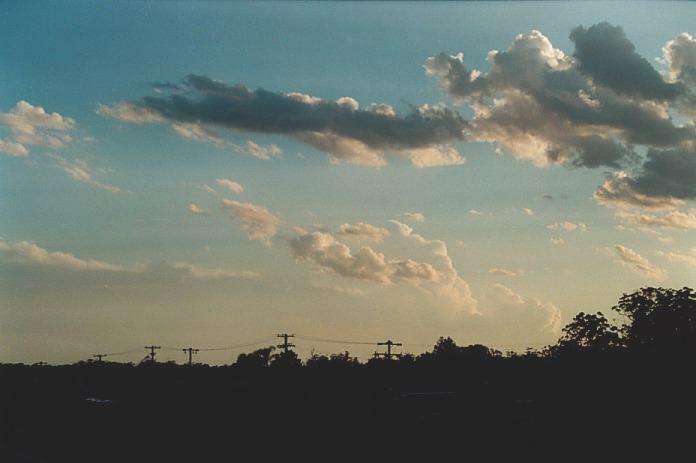 I observed some large cumulus with reasonable structure developing to the south but thought it would dissipate during the night. I went to bed about 11pm and whilst closing my eyes, noticed a flash. I thought my mind is playing tricks on me so I shut my eyes again. Alas - another flash!! I looked out the window to see what it was. I'll be damned!! 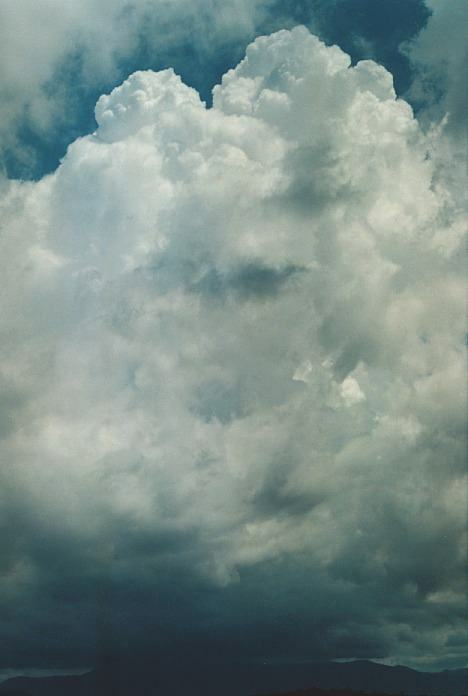 There was a tower popping up to the east and it had amazing structure but no anvil. 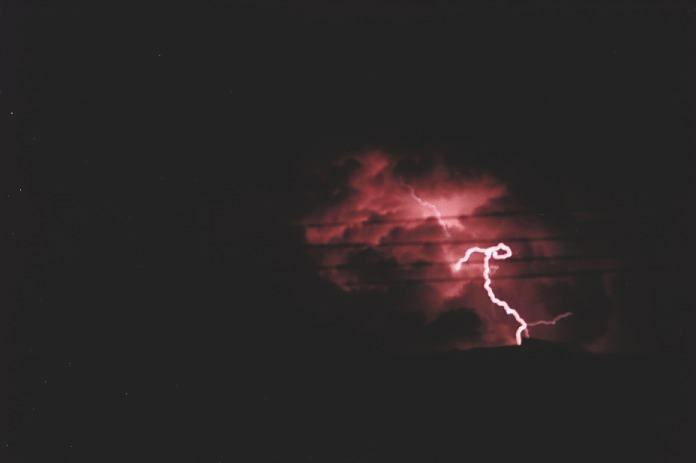 This meant that some of the lightning bolts were coming out of the side and top of the storm. I could stand it no longer so I decided to take some footage and photographs of it. It was quite awesome and was quite noticeable by people making comments about the flashes and finding out what it was. Low cloud spoilt the party so I finally went and got some rest. 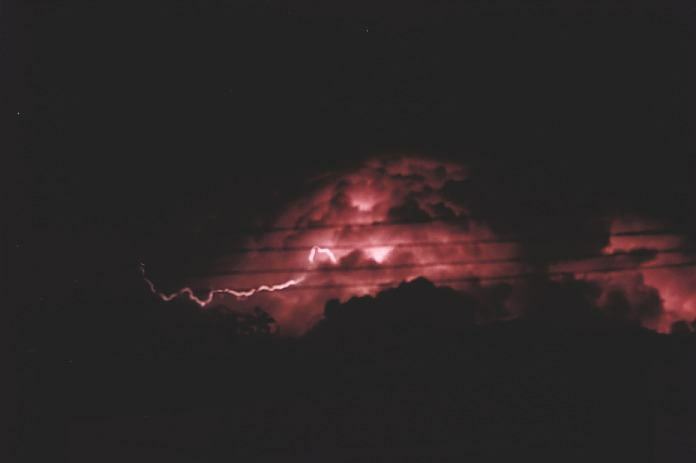 (I found out next morning that the low cloud had cleared and the storm had still remained active. 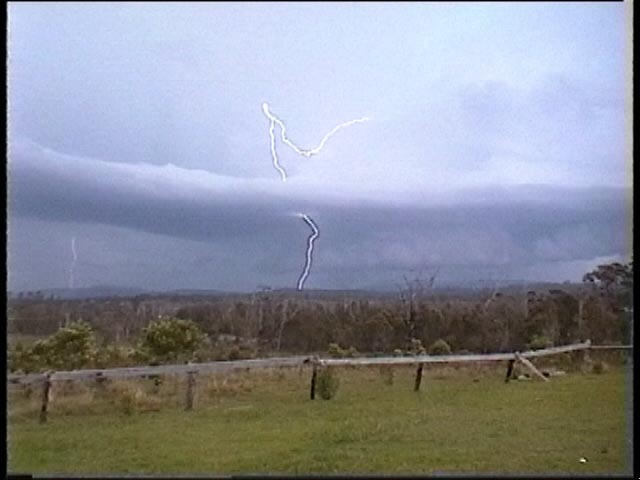 In fact I believe that there was a line of storms linked with those Michael Bath had photographed, see chase report). Sunday 5th November 2000 - The day of the Coffs Harbour Supercell and "beaver tail"
There didn't seem anything unusual about this day. 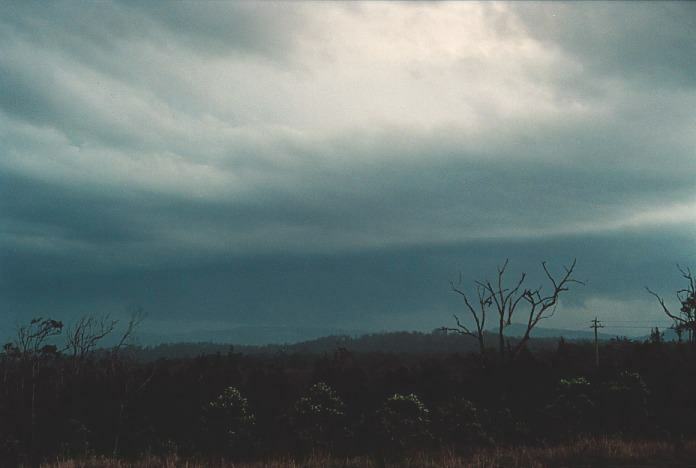 There were storms towards the coast coming closer to the coast near Coff Harbour. Being Sunday, I knew I had to head home. But I wanted a piece of the action on the way down. Little did I realise what was going to happen that day. I asked Michael Bath to give me a careful run through what was the expected conditions that day. When he read out the winds at various heights, I could not hold back my excitement. 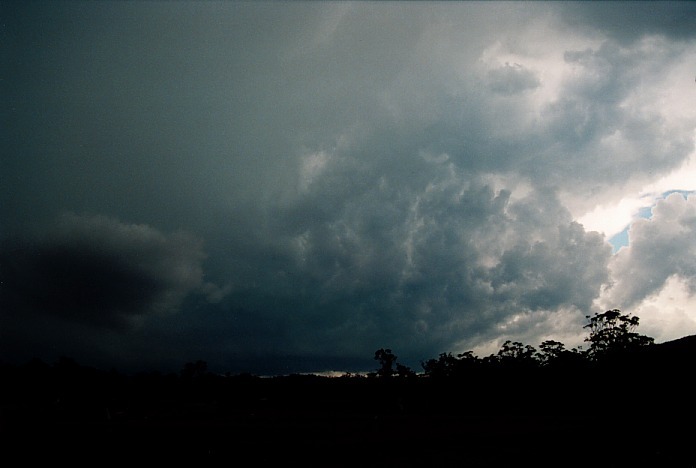 I knew that the section from Coffs Harbour northwards was in a zone for supercells, in fact I would not rule out tornadoes, though you don't tend to look much into those sort of thoughts. I decided to make my way down to Coffs Harbour region as that was where the storms seemed to be most active and closest to the coast. As I got closer I realised that there was persistent castellanus cloud. It seemed there was a trough of sorts extending from off the coast to the hills inland. 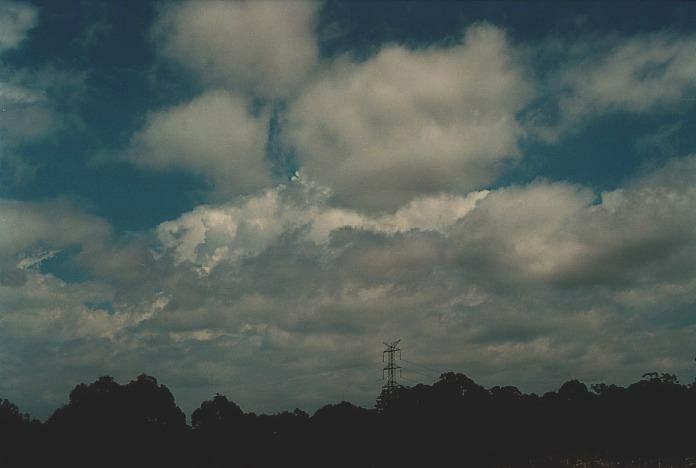 I remained about Urunga area and watched as the lower level cumulus (moisture source) began to clear slightly. 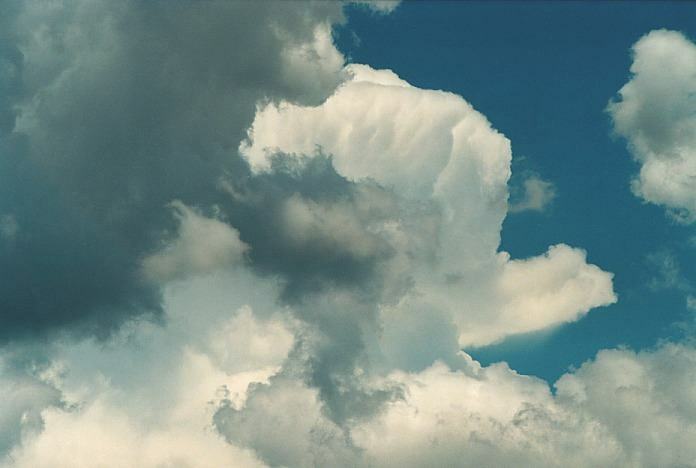 Coming to think of it, you could see the shear within the cumulus but I somehow missed it at the time. 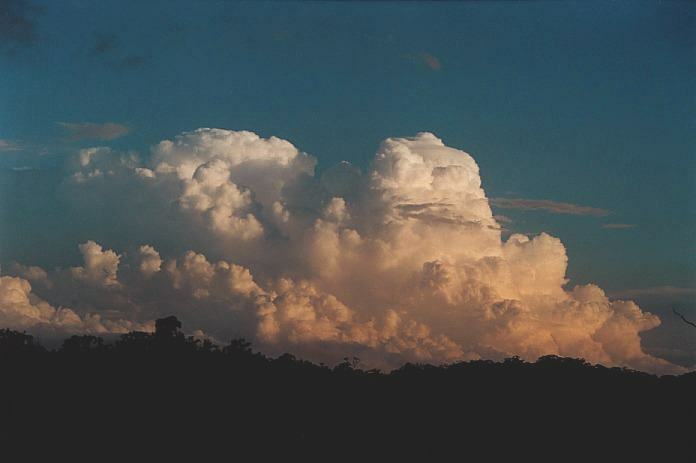 I then noticed a large cumulus develop along the range towards Dorrigo. 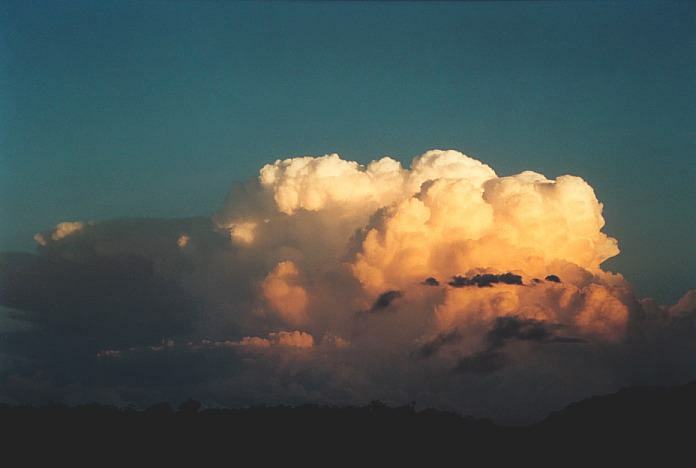 The mountain became enshrouded by the base of the large cumulus. 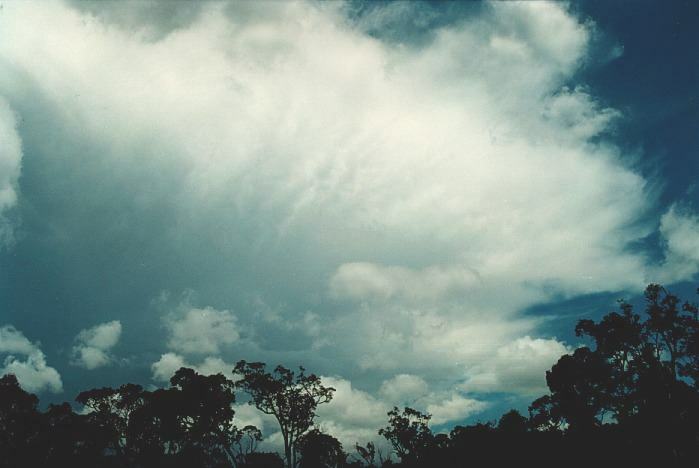 This quickly developed an anvil and dropped some large drops onto areas south of Coffs Harbour. 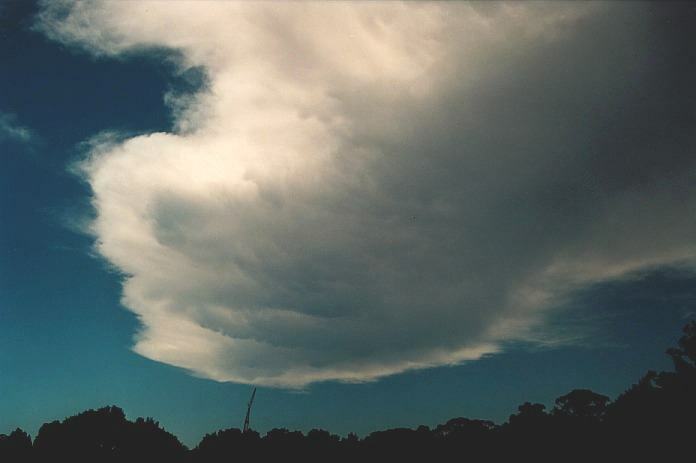 But it seemed the storm became quite active with a second strengthening of the anvil and the base of the storm became larger. 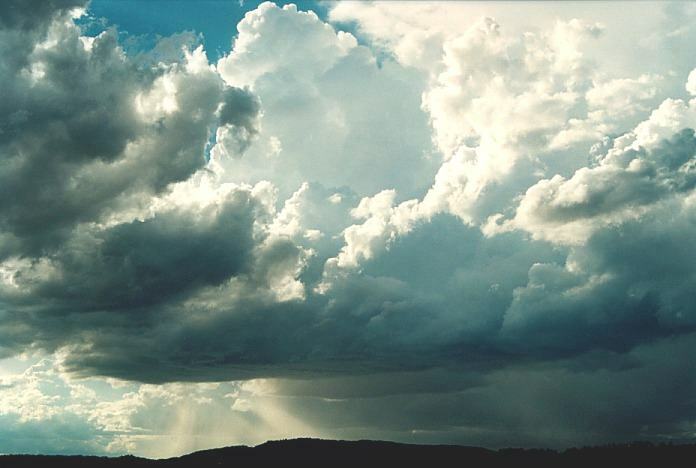 I was a little disappointed I recall that the storm after so much promise seemed so small. But the more I watched and moved into any available position, I realised that the side anvil was starting to spread. The spreading of the side anvil indicated two things: the storm was going to edge more north of my position and it was already severe. In fact, it would have already dropped large hail. 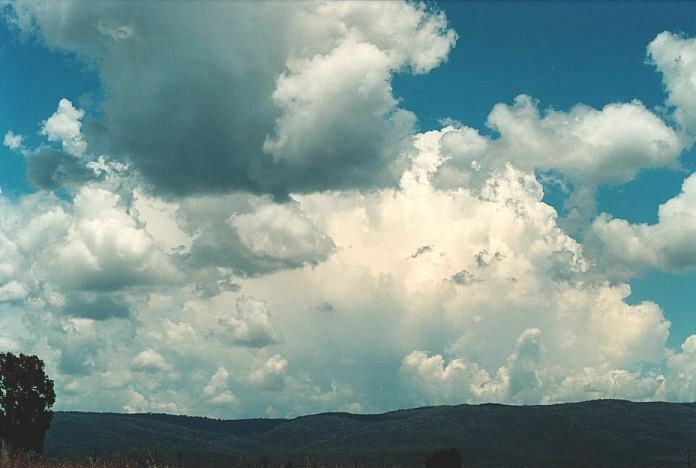 (I have confirmation that some areas in the hills such as Ulong received giant hail but mostly hail fused together but I am unsure of the time). 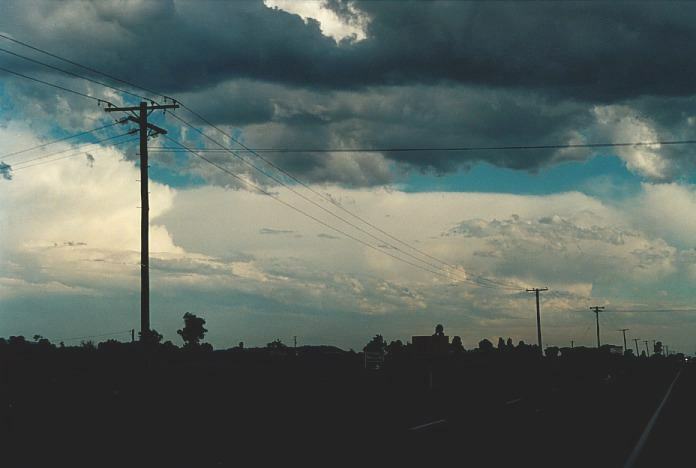 I gradually made my way north stopping at any position I could with at least some view of the storm. This proved difficult with the hills and trees in the area. 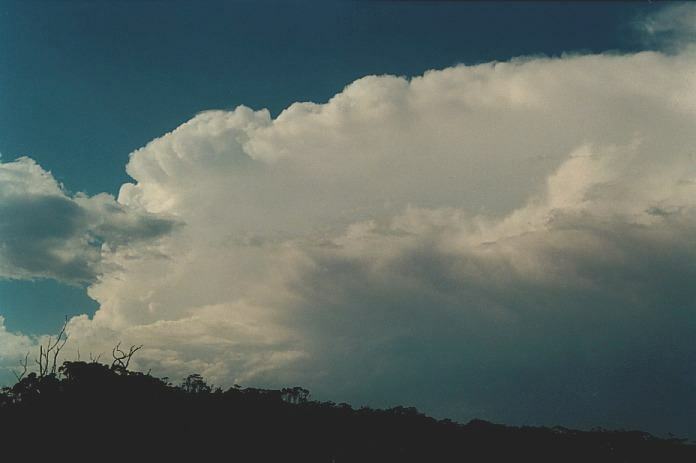 The storm was growing in size indicated by the strengthening anvil. In fact by the time I got to the first ideal position to watch the storm, it had grown into a monster. This vantage point overlooked the whole of Coffs Harbour. I could make out rotation in the base and the rain free base was massive. 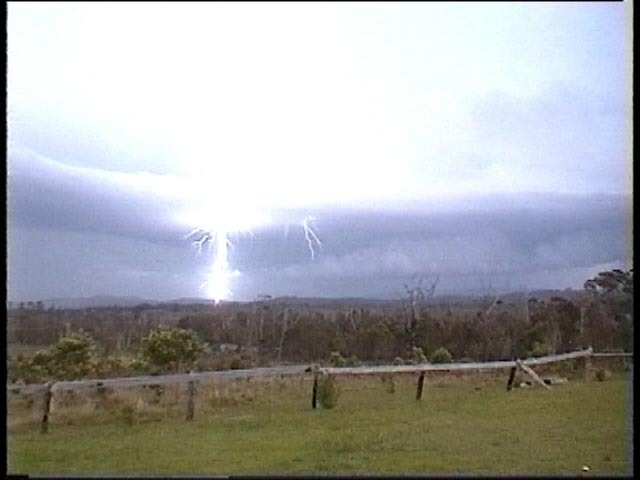 Cloud to ground lightning occurred reasonably frequently under the base. The base was so low that the base was almost touching the hills. 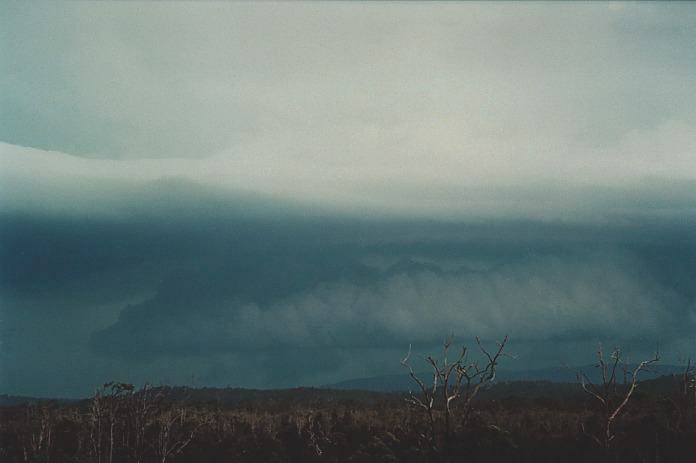 This made it quite difficult to observe any features that could develop under this base. The system was making a left turn northwards (left mover). 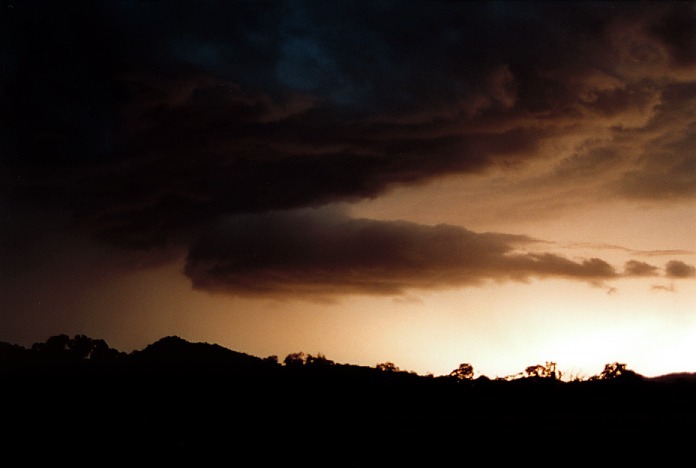 After some time viewing, the anvil began to drop large drops of rain and it meant I was confined to the car. Instead I decided to head further north. Next stop, an estate just north of Coffs Harbour. 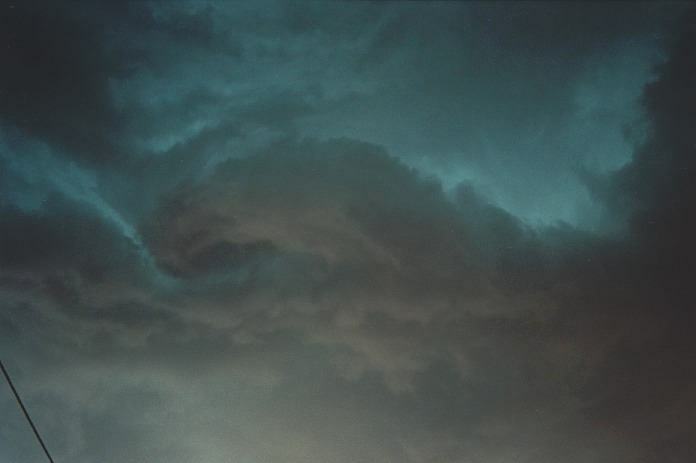 It was here I realised that it was turning into a classical supercell structure. The whole massive column indicated rotation and still although the storm was within 20 km from me, you could not see the base. 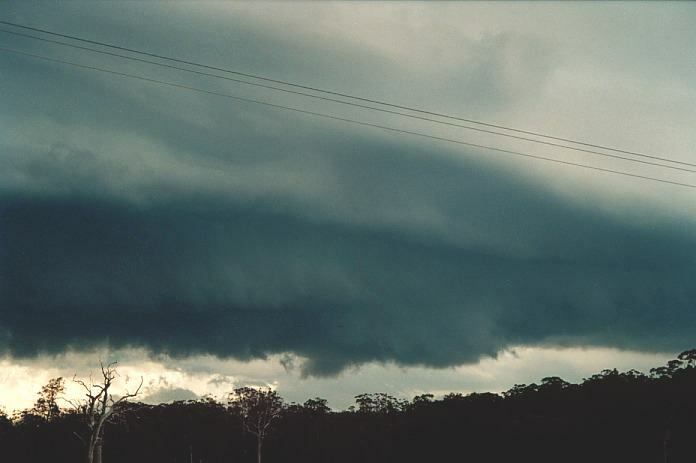 The inflow into the storm at times was gusty but not strong and directed to the area where the rain cascade met the rain-free base aiding the cyclonic rotation. 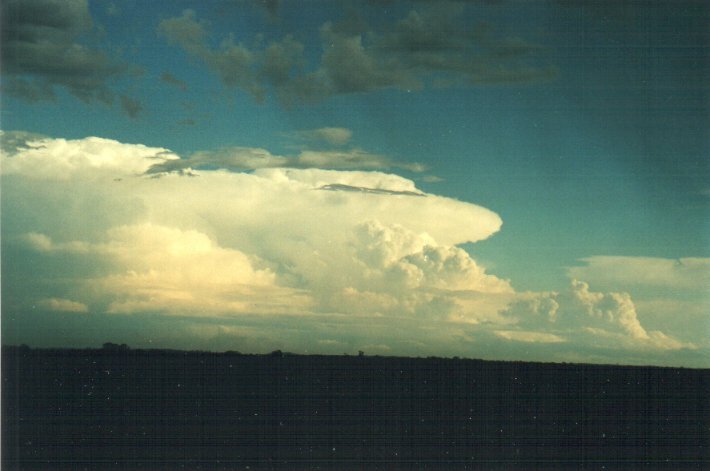 At times you could see the back-shearing of the anvil. Truly amazing. The contrast of the storm was incredible. 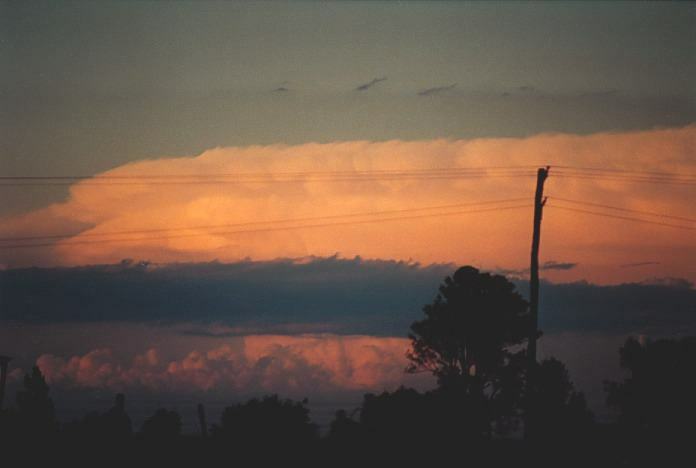 The anvil had spread well off the coast covering most of the sky-zone to the east!! 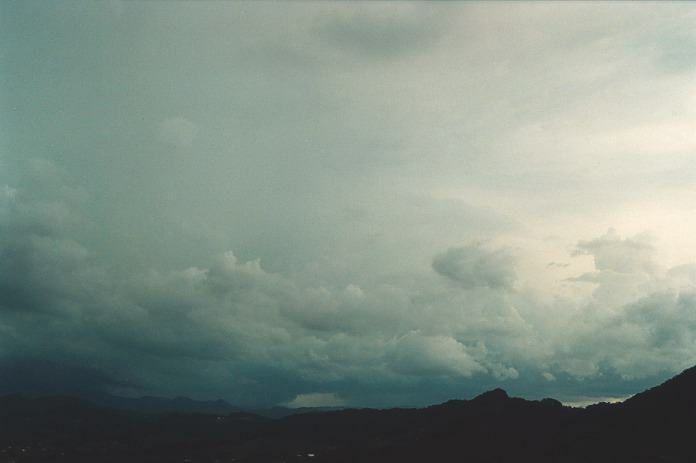 After some time taking video footage and photographs, it again began to rain mainly from the anvil. So it was again time to move on. 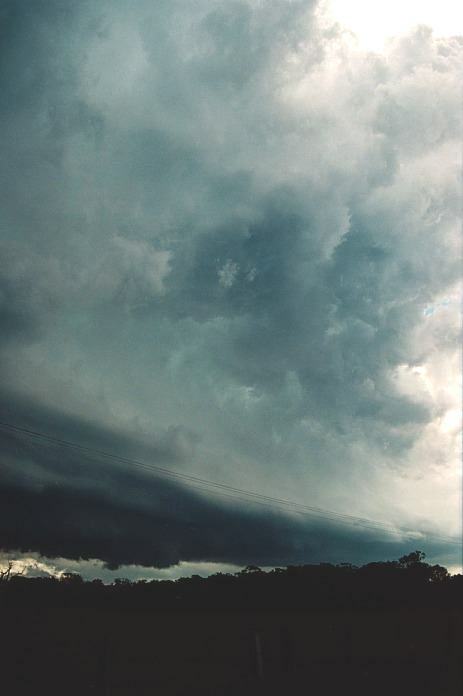 My view of the supercell Michael Bath was chasing at that time, see chase report. Woolgoolga was not the best place to stop. Again the hills seemed to be hiding the main base, and for some reason it did not look as good. One could have easily been mislead at this point to think the storm was weakening and becoming featureless. So I headed north along the Pacific Highway knowing that I would be running into bushland very soon and little viewing areas. Then I saw a turnoff to Corindi Beach. 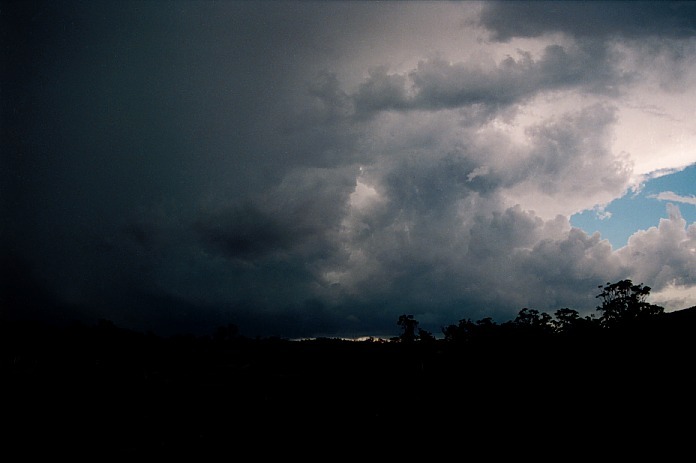 This turned out to be the best position that day - slightly elevated and I could finally see the whole storm. All I can say that it went through a phase of truly awesome structure. I really didn't care who was around me, what time it was. I think that anyone that rang me on the mobile phone or I rang them would have thought I was going mad. 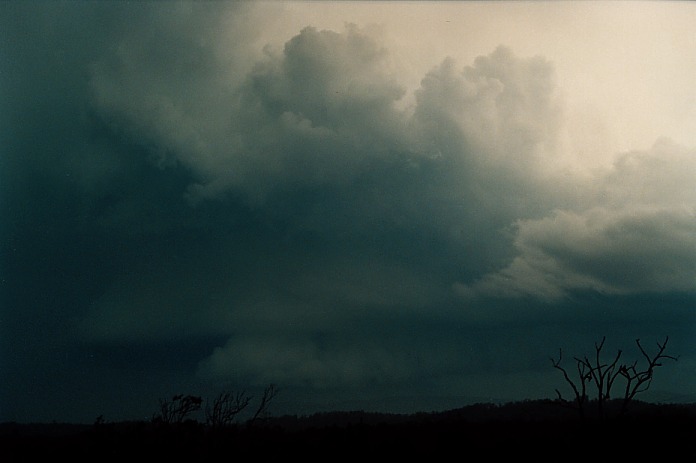 It seemed that a chaser's dream of high contrast awesome structure and a classical supercell had come in one hit. 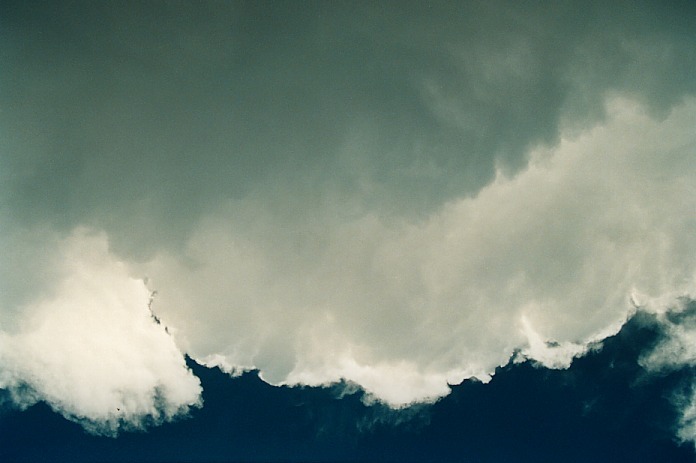 Paul Graham at this point in one of the phone calls and also from a previous phone call to a person at the Weather Company, indicated that the storm seemed to be weakening. In a protective fashion, my response to Paul was swift, "the radar must be not picking it up". I then realised that it was because the storm was developing a second major updraught. 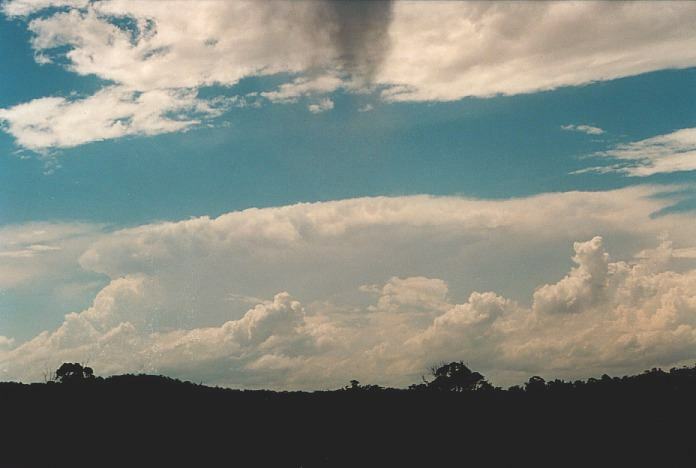 Please click to view the video clip showing the back sheared anvil, storm structure and inflow bands - 1.8mb. I apologise for my excitement but that is what happened at the time. 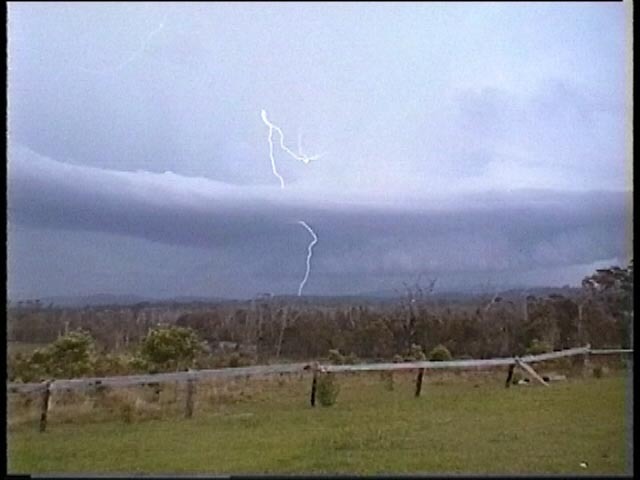 I was videoing during the phone call and suddenly recognised an inflow band. I had scanned it earlier without recognising it. I then shouted, "Hey. That's an inflow band". I moved to get a better view because of a tree and then confirmed it, "Yep. That is an inflow band!!" It stretched at least 15 kilometres to wards the base region. It slowly began to connect. This was a sight I would never forget. 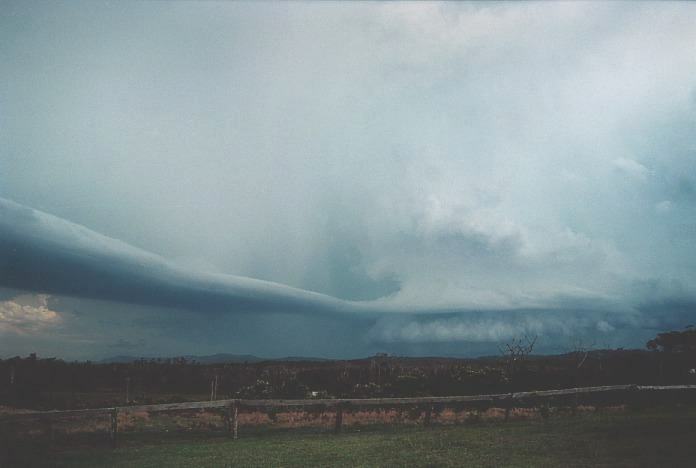 It certainly confirmed a classical supercell structure. 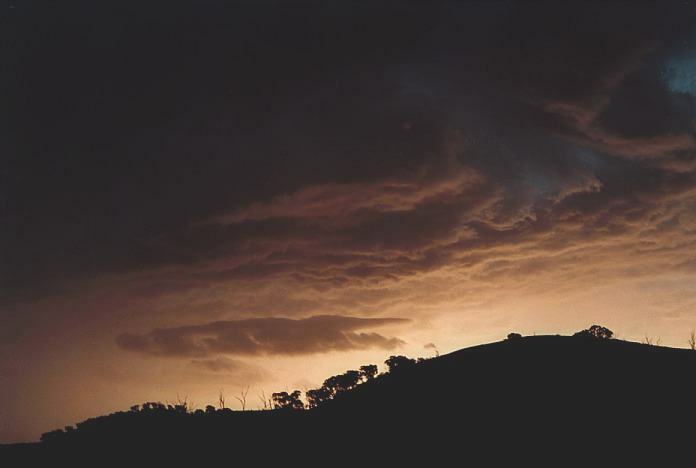 Michael had called earlier to say he was chasing another supercell near Casino and that he had seen a funnel. However, it was the second phone call that surprised me. Normally Michael would say, "Hi. It's me". But this time it was, "Hey. It's f�. huge". He suggested there were two overshoots observed from his position. Obviously cloud had cleared to reveal this system. I again described the scene but he was about to move and had to go. Where was the wall cloud, or wall clouds. Well it seems that there may have been a few updraughts within this system. And this meant that there was a wall cloud under the main tower and possibly another in the next updraught. The old decaying updraught was still evident next to the main tower but within the main precipitation area. 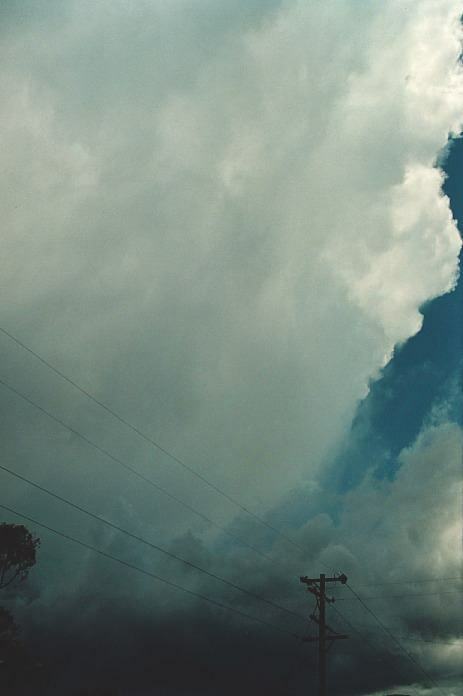 I then stopped to photograph the base and associated wall cloud number two perhaps associated with the earlier funnel. Then next stop was a service station but could not really get a good view of the storm base. I was also recovering from the lightning bolt experience and remained in the car. Finally I stopped off the main road on a side road with some clearer areas. I had by now realised that it was going to be a late night and that any further north and I was going to be moving away from Sydney. 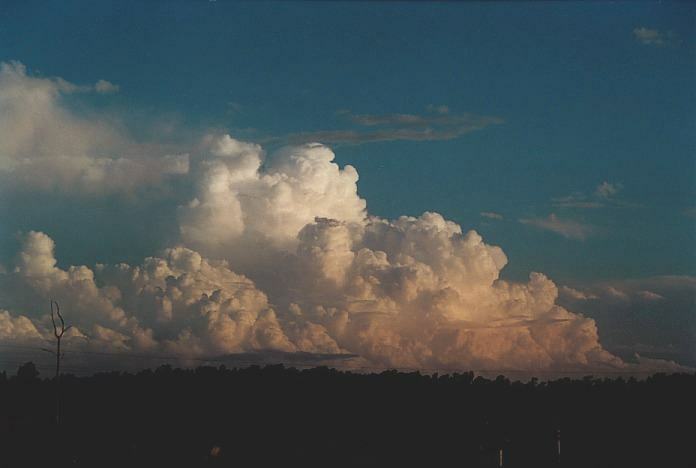 There were towers developing along the main storm zone with suspicious lowerings observed. Hail began to fall, probably up to 3cm in size but very sporadic. I tried to take cover but I only copped a few dents from the hail. I believe hail close to if not about the size of giant hail may have fallen further along the path of this cell, definitely large hail perhaps the size of golf balls. This was to be the turning point of the day. I had to make the decision to move further south again and gradually head for home. I made my way to Corindi Beach. 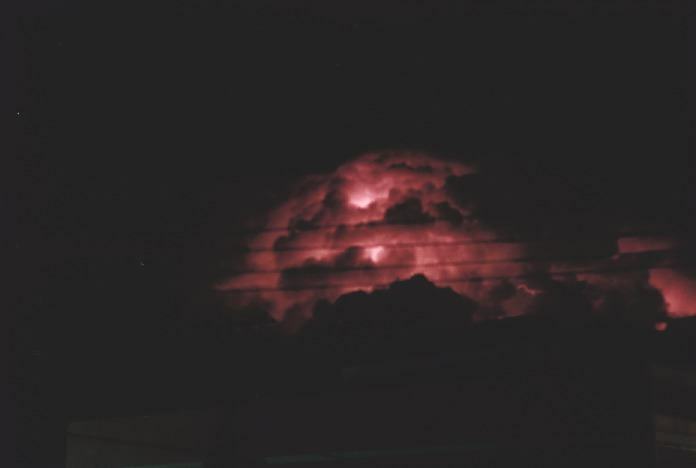 I was able to get a view from the southern side of the storm. It was very crisp and white. It was a very large system as well. 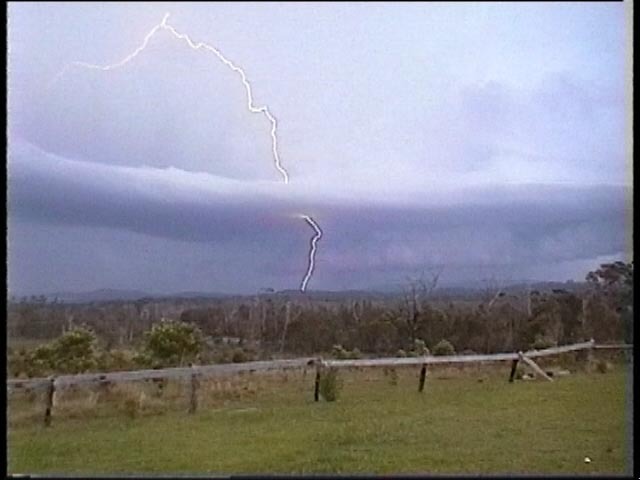 Also to the south, there was a supercell probably very close to the coast. So I decided to get closer to it. In fact all the way down the coast, I observed various right flank and left flank structures. I also observed a nice strong updraught developing off the coast and the sunlit features were awesome. 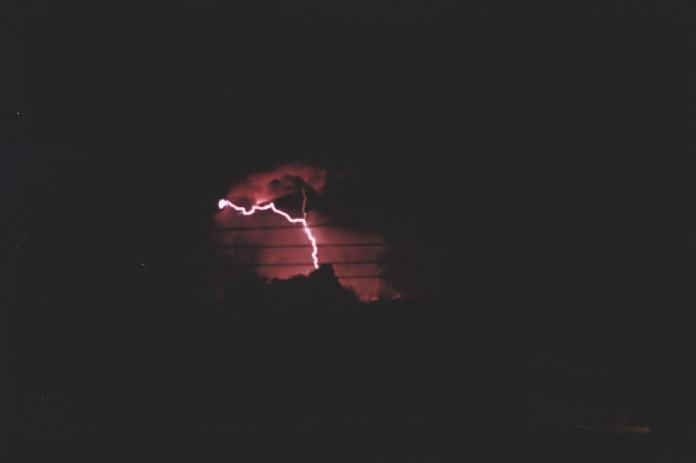 I also observed later on the lightning it displayed. 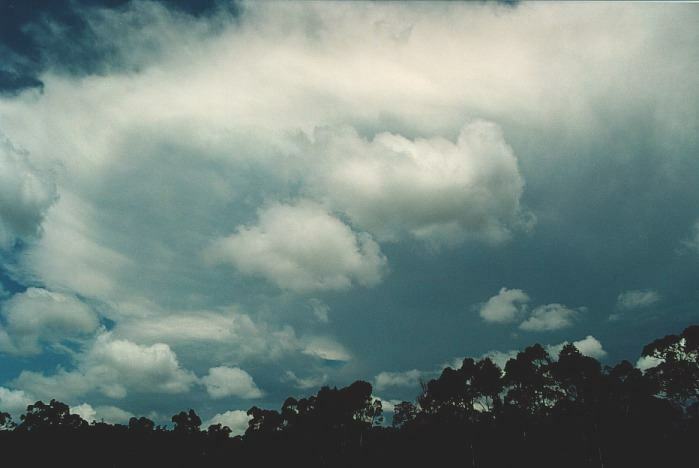 Whilst at Taree, an interview with The Weather Company had taken place (arranged earlier). I took the opportunity to make sure the video was on the car. I was a little annoyed, but later laughed, at the truck who created a wind that tipped the video camera to an angle. I was on a high right down the coast. Even as I approached Bulahdelah, there was another supercell that had tracked off the coast and giving a spectacular lightning display. 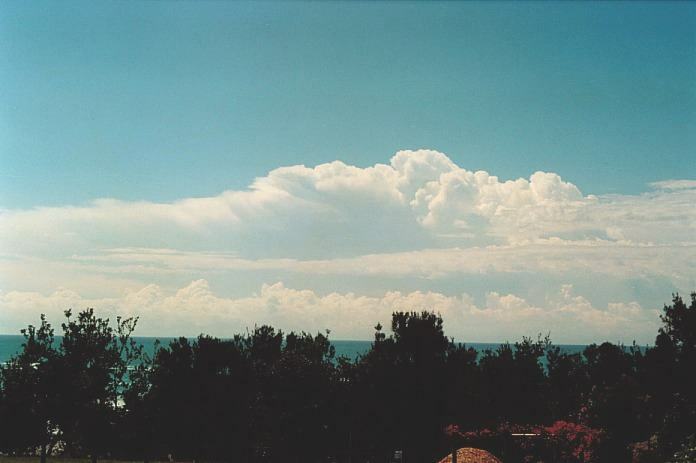 It seems the whole coastline north of Sydney had storms and supercells gradually moving off the coast. I had made several mobile phone calls that day and it helped run up the highest bill. I was not a little bothered though. 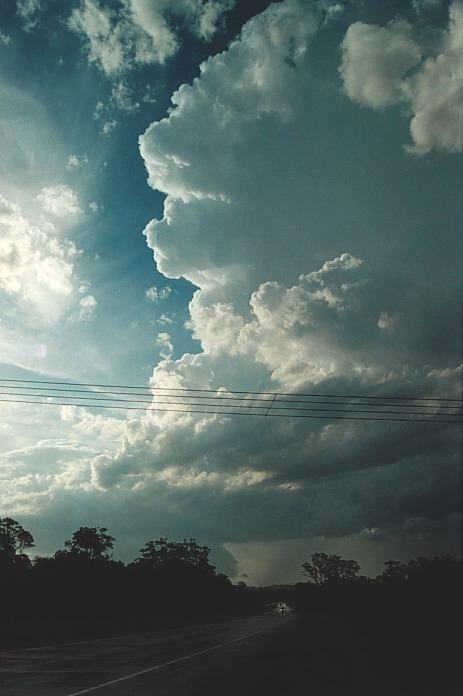 Looking back at the day, I wished now I had stayed up north for the night and stayed ahead of the classic supercell. I could have easily awoken early the next morning and made the trip down to Sydney. Although I don't like comparing storms, the feelings and emotions I got from this storm will ensure I will never forget it. I also looked back and thought just how difficult the chase was to navigate, answer phones, take videos and keep track of the storm in an area where I for one did not know much about and except for the main road but also was very difficult to observe the storm due to the trees and hills. I would like to thank all those who again were able to give updates as to what was going on but mainly for being able to share the excitement. I felt even though I was physically alone, that there was someone there to share the experience. This was one special chase.